In March 1937 a gas leak caused a massive explosion that killed almost 300 children and teachers at a school in New London, Texas. Amidst the backdrop of this catastrophic event, a Mexican-American girl falls in love with a Black boy in a segregated oil town. In a town where store signs mandate “No Negroes, Mexicans, or dogs,” Naomi Vargas and Wash Fuller know not to cross the deeply entrenched color lines. Yet the heart wants what it wants and societal barriers are no match for young love. Like a ticking time bomb, the tension builds as their love blossoms. And when tragedy strikes, the young lovers struggle to find a shred of light amidst the shroud of darkness. Will they overcome the forces of hate and intolerance that loom over their town, their school—even their own homes? You’ll have to read the book to find out! Out of Darkness hits shelves Sept. 1, 2015. 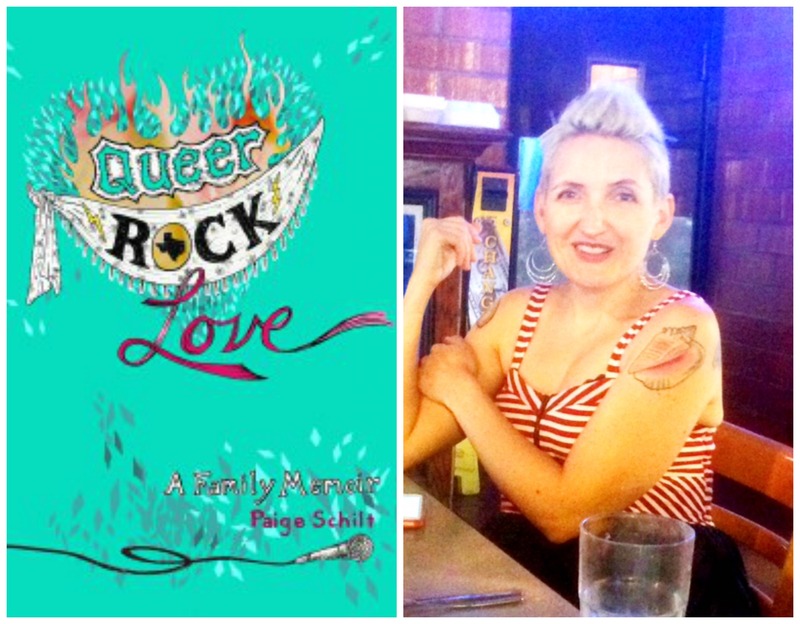 The author Ashley Hope Pérez—who just so happens to be a proud Longhorn—was kind enough to share some insight into this multifaceted tale of love, loss, family and the ugly forces that drive people apart. Read on to learn more about the book—and how many of the themes touch on issues we face today in American society. What made you decide to write a story about the 1937 New London school explosion? I grew up about 20 minutes from New London. The explosion—which happened at 3:17 on March 18, 1937—was always a kind of shadowy event that I’d hear whispered about from time to time but rarely discussed openly. At one point, I remember driving by the site of the disaster with my father and him telling me the story of a little girl who could only be identified because she had colored her toenails with a crayon. I didn’t know many specifics of the explosion, only that it had killed hundreds of children. When I returned to the event as a novelist, I was interested in more than the explosion itself: I wanted to examine how this kind of tragedy might ripple through a community, bringing out the best in some and the worst in others and catalyzing more loss. How can readers relate to the characters in your book? Okay, first some quick introductions. Four characters are at the heart of the story in Out of Darkness. There’s Wash Fuller.The teenage son of the New London Colored School’s principal, Wash has always lived in East Texas and prides himself on knowing his way around both the woods and the prettiest girls from Egypt Town, where most of the Black community lives. Wash’s days as a womanizer come to an end when he meets Naomi Vargas, a beautiful and painfully shy girl from San Antonio who has just moved to New London with her younger twin half-siblings, Beto and Cari (short for Roberto and Caridad). The three of them have been brought to East Texas by Naomi’s white stepfather after he has a conversion experience and decides he ought to bring his family back together. Wash is easy for readers to relate to; he’s funny, loyal and passionate. Naomi is a quieter character, but readers quickly identify with her determination to protect the twins and her ability to persevere in spite of considerable hardship in the present and secrets from her past. Once Wash and Naomi fall in love, it would be impossible not to want them to have a future together. Romantic love intertwines with the love both Naomi and Wash feel for the twins, who also play an important part in the story. Some of the most beautiful parts of the book are when the four of them are together in the woods of East Texas. What do you hope readers will take away from Out of Darkness? I hope that readers will admire Naomi and Wash for their efforts to seize some joy for themselves at a time when the happiness and well-being of brown people was of little importance to most of American society. I hope that the barriers and flat-out cruelty that Naomi and Wash encounter in the world of 1937 may galvanize readers’ commitment to supporting people’s right to love whomever they love and build families around that love. That’s what Naomi and Wash try to do for the twins—make a family together in the secret still places along the Sabine River. Are there any themes in Out of Darkness that are relevant to current issues in our society? One of the most problematic views of racism is that it is “a thing of the past.” Out of Darkness shows racism and prejudice in the past, but it also creates opportunities to recognize the distressing continuities between our history and the present. We continue to see racialized violence in the news, both hate crimes like the church shooting in Charleston and acts of brutality by police and others that underscore disparities in how different members of our community are treated. This injustice and the distrust it breeds have deep roots. Out of Darkness asks readers to reckon with some of those roots as they existed here in Texas. Beyond the blatant discrimination and violent expressions of white supremacy that unfold in the characters’ experiences, the novel offers glimpses of systematic discrimination, as in the tripartite segregation of schools into white, “colored,” and “Mexican” in cities like San Antonio. I taught for three years in an inner-city school in Houston, and I can tell you that the consequences of that segregation and the disenfranchisement it produced are still being felt in African American and Latino communities. A new novel, this time exploring Latino experiences in the Midwest. (Although born a Texan, I’ve been in the Midwest for nearly a decade, and apparently that’s about how long it takes for a new place to show up in my fiction.) The new book also involves family and tragedy, but that’s about all I can say about it at this point because I’m wildly superstitious about discussing details of work in progress. Just that I hope Texans will not be scared off by some of the difficult issues in the novel and that they will instead embrace the chance to dive into our history in the company of characters worthy of their love and attention. Some people have suggested that Out of Darkness is a “brave” book, but I think it’s equally important to acknowledge that reading about painful features of our past takes courage. And, of course, a big thank you for the chance to share a bit about Out of Darkness with Longhorn readers. Many of my formative reading and writing experiences took place right on the UT campus between the wonderfully deteriorated walls of Parlin Hall. So… Hook ‘em! Want a sneak peek into the book? Visit the Texas Observer to read an excerpt! 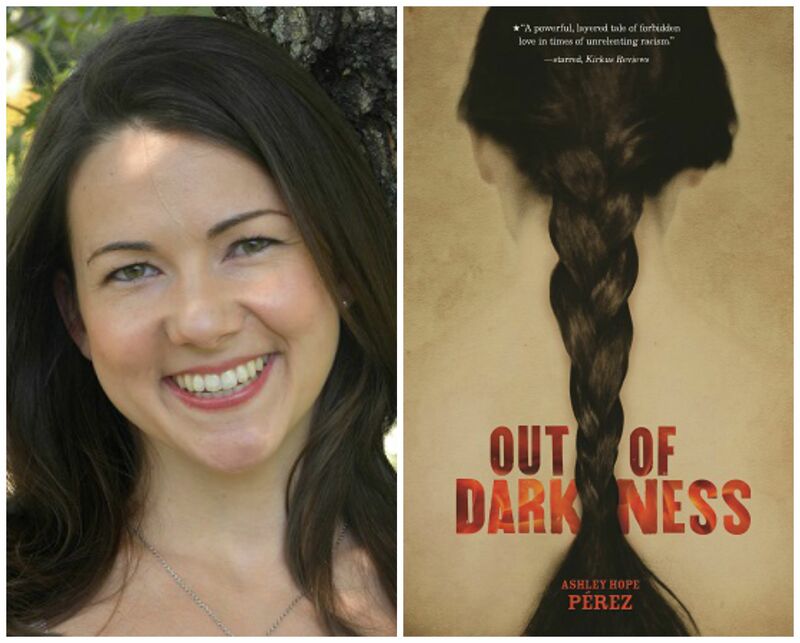 About the author: In addition to Out of Darkness, Ashley Hope Pérez is the author of the YA novels The Knife and the Butterfly, and What Can’t Wait. She grew up in Texas and taught high school in Houston before pursuing a Ph.D. in comparative literature. She is now a visiting assistant professor of comparative studies at The Ohio State University and spends most of her time reading, writing and teaching on topics from global youth narratives to Latin American and Latina/o fiction. She lives in Ohio with her husband, Arnulfo, and their son, Liam Miguel. 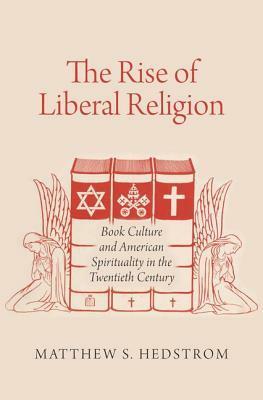 In “The Rise of Liberal Religion” historian and University of Texas at Austin alumnus Matthew Hedstrom attends to the critically important yet little-studied area of religious book culture, paying special attention to the popularization of religious liberalism in the 1920s, 1930s and 1940s. By looking at book weeks, book clubs, public libraries, new publishing enterprises, key authors and bestsellers, wartime reading programs and fan mail, among other sources, Hedstrom provides a rich, on-the-ground account of the men, women and organizations that drove religious liberalism’s midcentury cultural rise. In doing so, Hedstrom demonstrates how the religious middlebrow expanded beyond its Protestant roots in the post-WWII period and began using mystical and psychological spirituality as a platform for interreligious exchange. This history of religion and book culture not only shows how reading and book buying were critical 20th century religious practices, but also provides a model for thinking about the relationship of religion to consumer culture more broadly. Hedstrom recently answered some questions for ShelfLife@Texas about the progression of religious thought in midcentury America and how “The Rise of Liberal Religion” offers both innovative cultural history as well as ways of seeing the imprint of liberal religion in our own times. How did your interest in this project develop? I was a graduate student in American Studies at The University of Texas at Austin, looking for new ways to think about religion in the modern United States. Basically, I wanted to think about religion as a phenomenon not just of churches or other formal institutions, but as a part of culture more broadly. Also, in a related way, I wanted to think not just about official theology and ritual, but about religious sensibilities—about spirituality. As I was thinking about all these things, I came across a set of sources about religion and reading in the 20th century and thought, “Ah ha! This is how I can access the stories I want to tell.” So I began studying the history of religious books and reading in the 20th century, because I quickly came to see this as one of the most important ways that religion happens outside of church, especially in a consumer-oriented society like ours. That’s an important question, because I think for many people, the word “liberal” immediately brings to mind our polarized political environment of liberals vs. conservatives. But in religious terms it means something else. Religious liberals, from the 18th and 19th centuries to the present, have been those who have worked to reconcile their faith traditions—first Protestantism, but also Judaism and Catholicism—with the social and intellectual changes of the modern world. So religious liberals are those who have embraced science, including evolutionary biology, cosmology and psychology; have embraced historical critical study of the Bible; have engaged in interfaith dialogues; and in other ways have sought to modernize the intellectual life of their traditions. Liberalism also contains a strong, related element of individualism. Liberalism in political philosophy emphasizes individual rights, and liberal economics, in the traditional usage of the term, embraces the free market. Likewise, liberal religion sees the individual conscience and experience as the ultimate arbiter of truth, above the teachings of any church or creed. Why do you think such a large portion of American religious history assumes that the decline of mainline Protestantism indicates a failure of religious liberalism, and how did you go about demonstrating the cultural ascendancy of the latter? First of all, the decline of the mainline has been dramatic, and deeply traumatizing for many. There really was something worth calling a Protestant establishment in this country, and it really has gone away. Many scholars of American religion, especially in previous generations, were born and raised in that establishment, and were committed to it. They experienced the decline in number and influence of their denominations very personally. But with a bit of distance from that moment of loss—a period stemming at least from the 1960s, and by some measures back to the 1930s—we can see that religious liberal sensibilities have not suffered the same decline as the mainline did demographically. My study of book culture provides one window into this phenomenon. I show that as more and more Americans used the tools of the consumer marketplace—in this case, books—to inform and practice their faith, religious liberalism spread even as liberal churches declined. Churches still matter greatly, but the energies that religious liberals once channeled into church life are now directed into a much broader array of outlets, from social work to politics to the arts. I hope my book raises questions for my readers about the power of consumerism in our society. I hope my readers will come to see that the categories “religious” and “secular” are not very easy to disentangle—that psychology and spirituality, for example, often blur. And I hope my readers will look at religious liberalism as a significant religious tradition in the United States, one with strong ties to Protestantism but not limited to Protestantism. Much of the vitality in modern American religious life is in what might be called post-Protestant spirituality, and I want my readers to learn to see the contours of this phenomenon and to understand where it came from. What are some primary sources you researched that you would recommend to readers interested in the evolution of liberal religion? At the top of the list is the great classic of William James, “The Varieties of Religious Experience.” In this work, from 1902, James gives the clearest and most influential statement of religion as fundamentally individual in nature, as rooted in the solitary experience of the divine. So much of 20th century liberal religion stems from James’s categories. A few other works I highly recommend are Rufus Jones, “Social Law in the Spiritual World;” Harry Emerson Fosdick, “As I See Religion;” and Joshua Liebman, “Peace of Mind.” They are all highly readable works that address the mystical, aesthetic and psychological dimensions of religious life. Though my book covers the 20th century, I’d also recommend going back to some great works from the 19th century, such as Ralph Waldo Emerson’s “Divinity School Address,” or the poetry of Walt Whitman. You have said that your overarching interests include the social history of religious sensibilities and the cultural mechanisms of their production and propagation. Can you give us some other specific examples of what these interests address? The best examples I can give are the questions I sought to address in my book. I had read extensively about 19th and early 20th century religious liberals—about the transcendentalists, for example, or the organizers of the famous World’s Parliament of Religions in 1893—and I knew that these folks were the elites of their day, a religious avant-garde. And I also knew the research, mostly from sociologists, about the religion of the baby boomers and later generations from the 1970s to the present showed how deeply religious liberal ideas had penetrated by that point. But I wanted to know: How did this happen? How did our religious culture change so much? How did ideas about the utility of psychology to spirituality, or about the religious value of learning from other faith traditions, go from a radical fringe to the American mainstream over the course of the mid-20th century. This is what sent me looking for “cultural mechanisms,” and I think I found those in American consumer capitalism, especially that most important of religious commodities, the book. Can you tell us a little bit about your new project on race and the search for religious authenticity from the Civil War through the 1960s? This book project explores the crossing of racial boundaries for the purposes of religious exploration and inspiration in the century after the Civil War. In the final decades of the 19th century, increasing numbers of Americans began to cross racial boundaries in search of spiritual authenticity. Religious liberals, such as Unitarians, transcendentalists and members of the emerging modernist wing of American Protestantism, led the way, as they found themselves increasingly alienated from traditional sources of meaning in a rapidly modernizing society. As evangelical piety lost its hold for many young educated Americans, in other words, new sources of spiritual vitality needed to be found—and a surprising number of Americans in the era of Jim Crow found that spiritual vitality in the religious lives of African Americans and Asians. I plan to place the growing white fascination with African American culture—a phenomenon in popular culture, but also in religion—alongside the lesser-known stories of Asian religious influences. I have just begun to study the Japanese Christian Toyohiko Kagawa, for example, who became a celebrity among American Protestants between the world wars, and I am also researching the uses American church leaders made of Gandhi. We’ll see where it all goes! 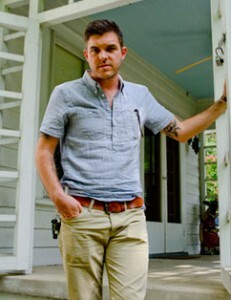 Kevin Powers, MFA ’12, has written one of the best books of the year, according to The New York Times and The Guardian, the British national daily newspaper that gave Powers its Guardian First Book Award. The prize, awarded in late November, is the latest of several accolades for “The Yellow Birds,” Powers’ debut novel about two young soldiers in the Iraq War. 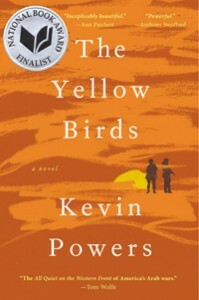 “The Yellow Birds” was also a National Book Award finalist. Powers returned to school — first to Virginia Commonwealth University, and then to the Michener Center for Writers at the University of Texas at Austin — after completing his military service. He wanted to pursue a childhood dream. Michener Center Director James Magnuson read swatches of Powers’ novel in a fiction workshop during Powers’ first year in the program. “The battle scenes were so intense and poetic. I knew there was something really special going on,” he said in a May 2012 article about Powers in KNOW. 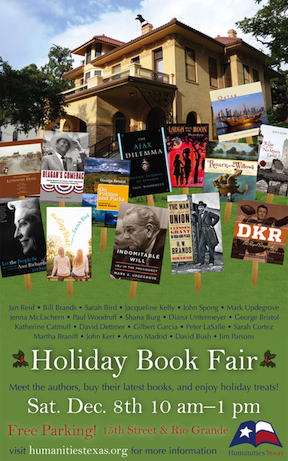 Humanities Texas will host its annual Holiday Book Fair in Austin at the historic Byrne-Reed House, 1410 Rio Grande on Saturday, December 8, from 10 a.m. to 1 p.m.
Noteworthy authors, including H.W. Brands, Jan Reid, Sarah Bird, John Spong, Mark Updegrove, David Dettmer, Katherine Catmull, Paul Woodruff, George Bristol, Jacqueline Kelly, Gilbert Garcia, Shana Burg, Peter LaSalle, Sarah Cortez, Martha Braniff, Diana Untermeyer, John Kerr, Jenna McEachern, Arturo Madrid, David Bush and Jim Parsons, will visit with holiday shoppers and sign copies of their latest books. Humanities Texas will have books available for purchase at a discount, along with a sale of homemade pastries and baked goods. Free parking will be available in St. Martin’s Evangelical Lutheran Church’s large parking lot on the northwest corner of 15th and Rio Grande Streets. All proceeds will benefit Texas libraries. 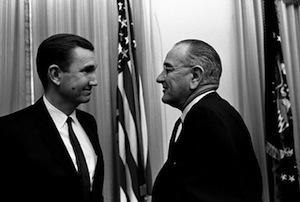 Attorney General Clark and President Lyndon B. Johnson in 1967. Ramsey Clark (Plan II, ’49), who served as attorney general under President Lyndon B. Johnson, will present a talk titled “From Civil Rights to Human Rights” on Monday, Nov. 12, from noon to 1 p.m. in the Law School’s Eidman Courtroom. The event is free and open to the public. William Ramsey Clark was appointed assistant attorney general of the Lands Division by President John F. Kennedy in 1961, when Clark was only thirty-three years old. After his tenure as assistant attorney general, Clark served as deputy attorney general from 1965 until 1967, when Johnson appointed him the 66th U.S. attorney general. Clark served as the attorney general until the end of the Johnson Administration in January 1969, and played an important role in the administration’s civil rights agenda, including supervising the drafting of the 1968 Civil Rights Act. Following his term as attorney general, Clark worked as a law professor and was active in the anti-Vietnam War movement. He undertook two unsuccessful Senate campaigns in New York. Clark became an anti-war and human rights activist, founding the International Action Center, and speaking out against the United States’ 1991 and 2003 military invasions of Iraq. Author of New York Times best-seller “Crime in America,” Clark served as legal counsel to many controversial figures, including Slobodan Milosevic and Saddam Hussein. In 2008 he received the prestigious United Nations Human Rights Prize. Clark was born in Dallas. At the age of seventeen he joined the Marine Corps and served in Europe in the final months of World War II. He received a bachelor’s degree in Plan II from The University of Texas at Austin and a law degree from the University of Chicago. After completing his education, Clark joined his father’s Texas law firm, Clark, Reed and Clark, where he remained until he was appointed assistant attorney general. Clark’s father was former U.S. Attorney General and Supreme Court Justice Tom C. Clark, ’22. Justice Clark’s papers are housed at the Law School’s Tarlton Law Library. The talk is co-presented by the two centers at the Law School — the Bernard and Audre Rapoport Center for Human Rights and Justice and the William Wayne Justice Center for Public Interest Law. Student organization co-sponsors include the Public Interest Law Association, the Texas Journal for Civil Liberties and Civil Rights, and the Thurgood Marshall Legal Society. University of Texas at Austin alumnus Jay S. Lefevers has written his compelling memoir titled “Cancer on the Brain” (Emerald Book Company. June, 2012). He will be signing books at the Barnes & Noble Arboretum, 10000 Research Blvd., in Austin, 6:30 p.m., Monday, August 6. The book chronicles a rollercoaster five-year period of Lefevers’ life, during which he coached a rough-and-tumble Little League All-Star team to victory, saw his appraisal company named to the “Inc. 5000” list, and raised three children with his wife – all while battling a brain tumor, surviving multiple operations, and then unexpectedly being diagnosed with lymphoma. Lefevers grew up in Austin, attended Westlake High School, and earned his Bachelor of Business Administration from The University of Texas at Austin in 1984, and his Master of Business Administration in finance from Baylor University in 1986.
can help people see that if you don’t fight for the care you or your loved ones deserve, it can be a matter of life or death. 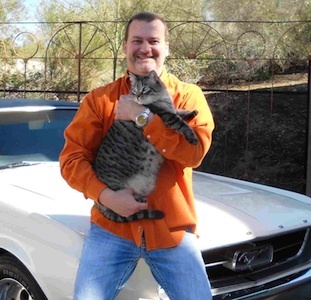 Lefevers, 50, founded his real estate company in Phoenix in 1992. That company, now called Lefevers Viewpoint Group, was named to Inc. magazine’s “Inc. 5000” list in 2008 – recognized as being one of the fastest growing companies in America. An inveterate entrepreneur, Lefevers has often invested in new businesses, and commercial buildings, and since 2010 has been an investor in Hollywood films such as 2011’s “Another Happy Day” starring Ellen Barkin and Demi Moore. Lefevers and his wife Lyn reside in Phoenix and have three college-age children: Briana, Adam, and Olivia. 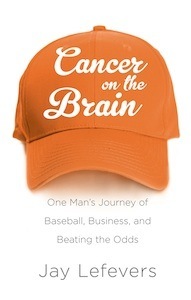 “Cancer on the Brain” is his first book. William J. Cobb (MA English, ’84) is a novelist, essayist and short fiction writer whose work has been published in The New Yorker, The Mississippi Review, The Antioch Review, and many others. 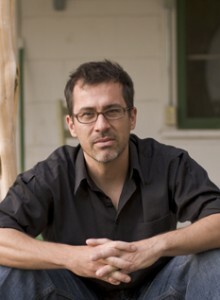 Before his most recent novel, “The Bird Saviors,” Cobb authored “Goodnight, Texas,” “The Fire Eaters” and a book of short stories titled “The White Tattoo.” He has received numerous awards, including a National Endowment for the Arts grant, the Sandstone Prize, an AWP Award for the Novel, and the prestigious Dobie-Paisano Fellowship — a prize sponsored by the Graduate School at The University of Texas at Austin and the Texas Institute of Letters that provides solitude, time and a comfortable place at J. Frank Dobie’s Paisano ranch house for Texas writers who have written significantly about Texas. 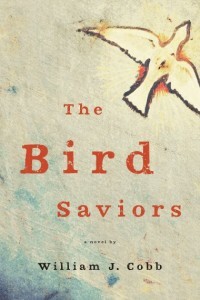 Set in a time of economic turmoil, virus fears, climate change, fundamentalist cults and illegal immigrant hardship, “The Bird Saviors” is a visionary story of defiance, anger and compassion, in which a young woman ultimately struggles to free herself from her domineering father, to raise her daughter in the chaos of the New West, and to become something greater. It is an elemental and timely vision of resilience and personal survival, but — most of all — of honest hope. We recently reviewed the book of an alumna that was set in Galveston, Texas — a city with which she has long had a fascination. You seem to have a strong interest in the American West. Where did that come from and how does it affect your writing? I am totally (and unabashedly) fascinated with the West (both New and Old), and see myself much more as a Western writer than anything else. Most of my childhood was spent on the northwest side of San Antonio (near Olmos Creek), and that landscape of cactus, juniper and oak trees, limestone hills and clear-flowing rivers and creeks enthralled me. I’ve written essays about how it seemed I was growing up on the border of the Old West, which I later found out to be quite true: A couple years ago I read S. C. Gwynne’s “Empire of the Summer Moon” (2010), about the history of the Quanah Parker and the Comanches, and there were many references of Comanches in that area of the Hill Country. But my obsession with Colorado really began when I was about nineteen years old, on my first trip there, en route to Montana: We slept on the floor of a group of archeologists involved in a dig near Cortez, Colorado, and I thought the mountains (and the people) were wild and beautiful. For the past thirty years or so I’ve spent some or all of my summers in the West, and for ten years now I’ve owned a second home in Colorado, which I think of as my real home. The West influences my writing greatly now, like an Appaloosa I like to ride. In particular I’m obsessed with that mixture of the past and the present — of outlaws gone, remembered and soon-to-be — of a landscape in flux. The summer of ’99 I lived in Creede, Colorado, and was jazzed to learn that Bat Masterson (I love the name.) once owned a saloon there. Robert Ford — “the man who shot Jesse James” — was shot to death there (in 1892, I believe) and was at one time buried in a cemetery through which I would often take my dog for a walk. I think of myself as something of a Western landscape writer, certainly not an “urban” writer. There are plenty of those in New York, but someone must celebrate the importance of the plains and the mountains far west of the East Coast. I’m glad to be one who does that. In 2004 you received the Dobie Paisano Jesse H. Jones Writing Fellowship: How was that experience for you personally and for your writing? Did you learn anything new about yourself or your writing process? My time at the Paisano Ranch was nothing short of bliss. That year (2004) had a wet spring, so Barton Creek flowed the whole time and my wife and I went for swims daily. Until the heat of summer set in, the air was cool, the fields were green and the wildflowers gorgeous. Although the ranch is only about seven miles from town, it was quiet and peaceful. At night, the most distinctive sound we heard were the lions roaring in a small zoo that was located near the entrance to the property, about a mile away. The bird life was amazing. In late April we started hearing a lovely trilling sound outside our bedroom window, and soon came to find a family of Eastern Screech Owls lived in the Elm Oak beside the patio. If you shone a flashlight over the fields, you could see just their glowing eyes as they hunted insects. We liked to say those were the souls of Comanches floating over the fields. I have a long list of Paisano birds sighted, which includes the remarkable sighting (by my wife) of a juvenile Whooping Crane (traveling along the Colorado River flyway, no doubt), Ospreys, Painted Buntings, Black-Billed Cuckoos and a Golden-Cheeked Warbler, which is extremely rare. The Chuck-Will’s Widows could be so loud at night we’d have to close the windows to get some sleep. My Paisano Fellowship came at a good time, when I was burned-out from teaching and needed some time to write: I finished the novel “Goodnight, Texas” there. What I learned most from that experience is to value the time free to write. People don’t realize how demanding the role of being a writing professor can be, how full your days can become, with no time to write. If I had the chance, I’d love to go back to Paisano and spend another spring there writing. We had a trio of longhorn steers that came to visit us regularly, and although I’m sure we weren’t supposed to, we left the gate open so they could come inside and eat the sweet grass close to the house. My wife even hand-fed them now and then. They liked her cornbread the best. Although you were raised in Texas, you live and write in Colorado and teach writing at Penn State, correct? Can you tell us a little about your teaching style in the classroom? I tell stories. One of my teaching assistants in a large-lecture class I taught not long ago said, after a few class sessions early in the term, “I have to come up with some anecdotes to tell.” Since most of what I teach is about storytelling, I think it’s a good way to approach the subject matter, by doing it as well. I love the anecdote related about Vladimir Nabokov in his “Lectures on Russian Literature,” in which he is said to have asked all his students to give a reason why they were taking his course, and his favorite was, “Because I like stories.” Right now I’m reading the great evolutionary biologist E.O. Wilson’s new book, “The Social Conquest of Earth,” and although much of the material is rather cerebral and analytical, he still manages to tell a lot of stories, such as anecdotes about his adventures as a field biologist studying ants in South America. I don’t think of this as “lite” or “easy,” either. Great storytelling is a rigorous endeavor. We understand the world through the stories we tell, the tales we share with another. In explaining the evolutionary steps to the development of human consciousness, E. O. Wilson cites the role of the campfire and hearth as central to our development. We became human, after millennia of sitting around the campfire, telling stories. It’s the essence of what makes us special. How did your idea for “The Bird Saviors” develop? Two things kicked this novel into being: At some point I heard a voice in my head — Ruby’s voiceover in the beginning of the novel — and I jotted that down, which contains the first line: “Lord God is talking again. He does love to hear himself speak.” Her voice stuck with me for a long time, and I began with that. Yet I didn’t conceive of this as a singular story, but rather multi-voiced, with an ensemble cast of characters to provide a complex vision of this world. So the second seminal moment for “The Bird Saviors” occurred when I heard an anecdote about a young woman engaged to be married, then after her fiancé cancelled the engagement, he asked for the ring back. She refused. Soon afterward her apartment was burgled, and the only thing stolen was the engagement ring. Naturally her family suspected the fiancé was the culprit. I was fascinated by the story, by the gall of the fiancé to ask for the engagement ring back, and even more so to break into her apartment to steal it back. That was the catalyst that set everything else in motion: Once I understood Ruby’s and Becca’s characters, the other people and events developed naturally. I always pictured it in the not-too-distant future, too, when the landscape is parched and dusty by drought. Unfortunately, in Colorado that’s only too true right now. You have described yourself as “committed naturalist and card-carrying member of the ABA (American Birding Association),” and although it’s by no means heavy-handed, there is an environmental conservation theme running through this book. Can you tell us about how some of your personal passions find their way into your fiction? I certainly hope I never use a heavy hand in my approach, but I want my fiction to be engaged in the world, and not to be about only my life, say, or my petty likes and dislikes, but things that matter. As a father, I’m concerned about the way I see the world changing now, and am worried about how much we might alter the natural balance of the world, particularly in the Southwest, which is focal point, to some extent, for climate change. I have no patience for climate change deniers or so-called “skeptics.” Too often mainstream media outlets are giving space to kooks and shills who have some dubious if not despicable agenda. The evidence for climate change is now overwhelming. There’s a deadly epidemic in the background of “The Bird Saviors,” and one of the dangers of climate change is that it may well alter habitats in ways we don’t understand, and push viruses into the human population that have been secluded or dormant for years. For those interested, one of the best books I’ve read recently on the subject is Michael Mann’s “The Hockey Stick and the Climate Wars” (2012), which tells the story of Climategate from the scientist whose emails were stolen and distorted. I certainly believe that writers should speak out, should touch on what is close to their hearts, and what concerns the rest of the world. Right now I think the biggest issue facing the world is environmental and economic collapse, and I touch on both of these in “The Bird Saviors.” Some of my fiction has seemed prophetic at times, such as my previous novel — “Goodnight, Texas” — imagined a great storm hitting the Texas coast, and was written before both Hurricane Katrina and Hurricane Ivan. That said, I don’t have a prophetic bone in my body. But I read much science-related nonfiction, and perhaps because of that, I can read the writing on the wall. I like that idea of “taking away” something from a book. One of the things fiction (and all writing, actually) does best is to give something to its readers. So what do I hope I’m giving readers? That image of a young mother lost in a desert town blanketed with pink snow, at the novel’s beginning, when Ruby flees her father and walks miles across the prairie and through town to reach her mother, just as a dust storm collides with a cold front. Or the gutsy strength and artistry of George Armstrong Crowfoot — a Native American who functions as a kind of avenging angel and chronicles this changing world by painting petroglyphs on a mesa’s cliff-side. Or the scheming pawn shop owner Hiram Page, who likes to quote various philosophers and kings as he cheats people and bilks the needy and desperate. He’s despicable, conniving, and the rest of the world has to move quickly to keep up with him. And Jack Brown’s squishy morality as he somehow justifies to himself that kidnapping a toddler in exchange for a pickup truck is not a reprehensible act. Or Fufu’s trashy love for Officer Israel James. And much, much more. Right now I’m off from teaching for eight months and plan to write the first draft of a new novel tentatively titled “The Donkey Woman.” It’s loosely based on the donkey woman folktale I heard while growing up in the Texas Hill Country, which I later learned was a retelling of the famous La Llorona folktale from Mexican culture. I’ve got the itch to write it, which is always a good sign. 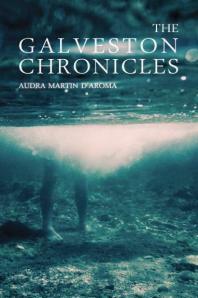 Spanning a little over a century, “The Galveston Chronicles” (Rozlyn Press, February 2012) is the story of four generations of women who feel an intense pull to the island of Galveston, Texas even though their lives continue to be interrupted by hurricanes. The novel opens in the stifling days before the Galveston Hurricane of 1900, when the wealthy Isadora Khaled begins to dream about catfish and murdering her daughter, setting off a chain of events that will not be resolved until Hurricane Ike in 2008. Isadora’s descendants are defined by and eventually named after the hurricanes that shape their lives: Fatima, who enters into a doomed relationship with a visiting artist in 1961; her drug-numbed daughter Carla, desperate to get home in 1983; and Carla’s daughter Alicia, reunited with her heritage on a modern island embracing disaster culture in 2008. Though she and her family were from Houston, author Audra Martin D’Aroma visited her grandparents’ house in Galveston throughout her childhood, developing a strong attachment to the island and an interest in how the people responded to hurricanes. Interested in what these reactions say about the places people are from, D’Aroma has maintained a lifelong fascination with the psychological landscape of the Gulf Coast. This University of Texas alumna (English, ’99) and up-and-coming author chatted with ShelfLife@Texas about “The Galveston Chronicles” and what the future holds for her writing career. How did you develop such a strong love for Galveston and hurricane culture? When I was younger, my grandparents had a vacation house on the West end of Galveston and we spent a lot of time there. It was way less developed back then. I think Galveston is a really fascinating place because it has an interesting mix of characteristics that make for strange bedmates — a Victorian aesthetic mixed with an existential, end-of-the-world feeling. I was also fascinated just how much the island lives in the shadow of the 1900 Storm. In that way it is almost polar opposite of its neighbor Houston, where I come from. We take pleasure in tearing down any signs of our history and starting over while Galveston at some point made a decision that it was better to be defined by a tragedy than to risk having no identity at all. As for hurricane culture, I think that the way we react to hurricanes says a lot about us — about our ideas of private property, our inherent distrust of government and our nervous energy. In fact, sometimes I think that if an anthropologist were to come to this region 1,000 years from now and try to dig up signs of what we were like as a culture, they might think that hurricane season was a religious season like Lent. Why did you choose to major in English and Art History instead of Rhetoric and Writing? How do you feel this selection of majors prepared you for your professional writing career? Sadly, I think I chose English because I wanted to be able to read as much fiction as possible while getting my degree. I was originally a political science minor but then switched to art history after taking an introductory class freshman year and falling in love with Caravaggio. I think that, through the direction of my studies, I developed an idea about craft as something to be learned from the Old Masters, either in the visual arts or in writing. I took one writing class at UT from Peter LaSalle, and it had a huge effect on me. I think he’s writing some of the most interesting and experimental fiction, but in the class nothing was about finding your own voice or tapping into your own creativity. He just taught the fundamentals of the craft. It instilled in me the idea that one thing had to come before the other was possible. I can’t really remember. I started writing it in 2005 (before Hurricane Katrina), and I think the whole story came to me in a flash and then it took almost seven years of backtracking to try to hammer the plot down. I didn’t want to have a single character carry the story like a lot of people suggested, so I relied on this idea of ancestral memory to link the episodes. I’ve always noticed that on Galveston, people frame their stories using the hurricanes as markers. Did you do a lot of historical research on the city throughout the writing process? I did, but I also relied on a lot of other people. My mother is a history buff, so she helped a lot with it. There are a few writers, namely Gary Cartwright and Stan Blazyk, who did a great job of capturing the history. My editor was ruthless in taking out historical details that didn’t add to the story. Diane Wilson, author of “Diary of an Eco Outlaw,” reviewed “The Galveston Chronicles,” and said that you “weave Galveston Island and those hurricanes into [your] story like Faulkner wove Yoknapatawpha County into ‘Absalom, Absalom!’, where the land was always not far behind in any dealings that the characters hatched up.” How do you think giving agency to a setting or location affects your novel, and do you have any other locations you feel could serve as the basis for a novel? I would almost go as far to say that the entire reason I write is to explain to myself what it means to come from East Texas-West Louisiana, meaning the 360 or so miles between Houston and New Orleans. I think we have three of the ten largest oil refineries in the world in that area, and so you grow up in this environment where nature and industry are almost inextricably combined. I am interested in how that affects both our ideas of beauty and our personality. I can’t really tell you how that is, but I do know that I like to write about people watching oil refineries being lit up at night and missing hurricane season more than positive holidays. An idea of the mood and the sense of place that made me write the book. I am working on a novel about the reverse immigration of a down-on-her-luck young mother in Lake Charles, Louisiana who is accused of a crime and escapes to Beirut and [of the immigration] of her great-great grandmother who escaped the Ottoman Empire to Lake Charles a century earlier. How do some people have the ability to master a multitude of languages? What makes them tick? Are their brains wired differently from ours? These are just a few of the questions alumnus Michael Erard (M.A. 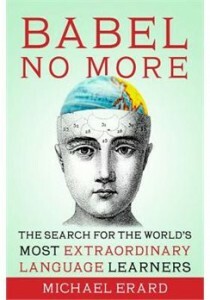 Linguistics, ‘96; Ph.D. English, ‘00) tackles in “Babel No More: The Search for the World’s Most Extraordinary Language Learners” (Free Press, 2012). While gathering research for his book, Erard traveled to far and distant lands – from Mexico to South India to California to Belgium – in search of hyperpolyglots, people who speak at least 11 languages. In the process, he analyzes the cultural role of language, and where it resides in the brain. Erard begins his quest by investigating the most famous hyperpolyglot, Giuseppe Mezzofanti, a 19-century priest who allegedly spoke 72 languages. Legend has it, the venerable multilingual defeated Lord Byron in a linguistic cursing contest. And after he died, people all over Europe vied for his skull. In search of modern-day Mezzofantis, Erard aims to answer the age-old question: What are the upper limits of the human ability to learn languages? Erard, who considers himself to be a “monolingual with benefits,” sat down with ShelfLife to discuss his interest in language acquisition, the mysterious phenomenon of multilingual dexterity, and the importance of breaking language barriers on a rapidly globalized planet. What spurred your interest in studying polyglot linguistics? I’d been working as a journalist, writing stories about languages, and a discussion popped up on a linguistics listserv about who the most lingual person in the world was, as well as the possibility of language learning talent as a heritable trait. Nearly no research or serious writing had been done about people who were gifted language learners and massive language accumulators, though when some people on the listserv said these people didn’t exist, it became terribly intriguing. Why do some people pick up multiple languages so easily? One reason is that they’ve already picked up multiple languages – they have a lot of knowledge about the basic patterns they’ll see in a grammar, and they know a lot about how they learn. (That is, if they’ve learned languages from a lot of different families.) Another reason is that they have powerful higher-order cognitive skills like working memory and executive function, which helps them use a lot of languages. They may have the ability to store memories and retrieve things from memory more quickly, as well to hear the differences between speech sounds. Did you come across any surprising findings during the research phase? Many, many surprising things on this journey! For instance, when I went to Bologna, Italy, to visit the archives of Cardinal Giuseppe Mezzofanti, a 19th century priest who is credited with knowing dozens of language, I found a lot of documents and other things which hadn’t been described before that shed light on his abilities as well as his myth. Going to South India where communities are naturally multilingual was very eye-opening. I loved talking to people who are language learners of all types and stripes. But I was perhaps most surprised by how difficult it is to say what it means to know a language when one has a very large repertoire of them. A language isn’t a unit of measure like an inch or a pound, so does someone with six languages really have more in his or her head than someone who only has one? What are some interesting techniques hyperpolyglots employ when teaching themselves new languages? Some were quirky in the sense that you wouldn’t encounter them in a standard language classroom, such as eliciting language from a native speaker, as an anthropologist or linguist traditionally would do. You can very rapidly build a mental model of all the language’s sounds and basic sentence patterns, all without a textbook or dictionary. Some methods were quirky in the sense that they look and sound odd. There is “shadowing,” which involves listening to foreign language material and attempting to reproduce it at the same moment one is hearing it, all while walking around outside making exaggerated gestures with one’s limbs. Someone suggested hanging out and playing games with kids who are native speakers in the language you want to learn – the language will be simple and repetitive, and if you’re fun to play with, the kids won’t care that you don’t sound like them. Are there any downsides to being a polyglot? One downside is that most professional contexts don’t reward you for learning more languages, so the happiest hyperpolyglots were ones in multilingual work settings where learning a language is a part of the job. Another one is that they have to work especially hard to find time for interests besides language, which can quickly consume you and be the only thing that you do. There’s the way people are always challenging you to perform in all of your languages, or to divulge the number of languages you speak. That seems to wear on them, because people don’t necessarily want to hear the details about what you can do. I hope that people take away the notion that successful language learning happens because of how the brain changes, not because an individual has more willpower, motivation or some other individual trait. I want to take foreign language learning out of the self and put it back into the brain. The goal is to illuminate the neurobiology of learning, which is an exciting area of research right now. One implication is that developing a globally competent workforce requires public support in order to create the environments and curricula for successful foreign language learning – individuals can’t be left to learn foreign languages on their own. I also hope that people take away the notion that even as adults they are capable of a considerable amount of learning, if only they abandon the notion that the native monolingual speaker is a meaningful standard or goal. How did your experience at The University of Texas at Austin shape your interests in becoming an author and studying linguistics? How did it shape me? Immensely. I received so much encouragement and interest from people both in and out of the classroom – it’s incredible. Having access to the library collections was a huge influence too. I spend a huge amount of time in the library for both of my books (not to mention my dissertation). Probably the biggest impact came late in grad school, in 2000, when I realized that I would be happier as a writer, not as an academic. That realization was spurred by my involvement with the Intellectual Entrepreneurship program, then housed on the Graduate School. Then, in 2008, I received the Dobie Paisano Writing Fellowship, a gift that provided what every writer needs: time and solitude. I am going to be promoting this book for a while. I’ve been working on it since 2005, so I would really like for people to know about it. Then I’ve got other book ideas to develop. Since 2008 I have worked as a researcher at a think-tank in Washington, D.C., and I would like to be able to focus on writing up some of my ideas in that realm. Writing a book with a day job basically means you have two jobs, and I’d like to have just one for a while. About the author: A native American English speaker, Erard lived in South America and Asia, where he learned to speak Spanish and Mandarin Chinese. His books and essays on language and culture have appeared in The New York Times, Atlantic Monthly, the Economist and Rolling Stone. His first book, “Um…:Slips, Stumbles, and Verbal Blunders, and What they Mean” is a natural history of things we wish we didn’t say (but do), as well as a look at what happens in our culture when we do (and wish we didn’t).